If you visit the swimming pool in pursuit of an aquatic workout rather than a jolly splash-about then goggles are essential. But with a confusing array of designs now available, where do you start? A pair of goggles is a necessity for swimming. However hard you try to keep your chlorine filled eyes open or crane your neck to keep your head out of the water, it is impossible to swim properly without eye protection. The distraction to your stroke can also encourage poor swimming technique, resulting in poor performance and even injury. Goggles can help improve body position and underwater orientation, and by making each turn and transition smoother, even make it easier to breathe. Although many survival experts insist that learning how to swim underwater without wearing goggles is a useful safety skill, for swimming lengths the naked eye is no match goggle vision. Given the myriad of goggle designs, features and prices now available in your local sports shop, it would seem the job of helping see underwater has become a complicated one. Instead of buying the only pair available and hoping for the best, you now need to consider such aspects as comfort, fit, UV protection, lens colour, and whether they are anti-fog, anti-scratch. But how important are these various factors? One of the biggest irritations about swimming goggles is their tendency to steam up after a short service in the water. This is of course prevents you from being able to see where you are going. Improved goggle technology has meant that this is less of a concern for modern swimmers with most designs advertising themselves as being ‘anti-fog’. However it is worth bearing in mind that such claims do not guarantee of fog-free swimming. The different coloured lenses available are not for show, but to suit different light conditions. So where you intend you use the goggles will affect which lens colour you choose. As a general rule darker, shaded lenses are intended for outside use in the sunshine, whilst clear lenses are designed to maximise the amount of the light available and are therefore more appropriate for indoor use. Goggles that offer UV protection should only be a consideration if you intend you use your goggles in a sun-kissed environment. It doesn’t matter if you buy the flashiest, most expensive pair on the market, if they don’t fit properly then water will leak in and render them absolutely useless. Different shaped goggles suit different shaped faces so it’s important to try out a few pairs before parting with your cash. You should look for a pair that matches the shape of your eye sockets. Once on they should sit comfortably around the eye socket and not dig into the side of your nose. 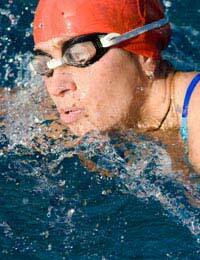 Many goggles feature an adjustable nose piece to allow them to be adapted to different sized faces. Although such a modification facility naturally increases the likelihood a pair of goggles will fit, there’s still no guarantee and so trying them out first is still advisable. As few shops will provide a bucket of water for testing whether a pair of goggles fit and are completely watertight, how do you know? The standard method is to squeeze each eye piece over your eyes one by one with the palm of your hand, and then let go. If the cups remain in place after a few seconds then they are likely a good fit. However, beware of goggles that create suction so strong it is uncomfortable and hurts your eyes. These will also likely leave you with ‘flesh goggles’ or ‘panda eyes’ after having removed them. Further Comfort ConsiderationsAs you will be wearing the goggles for extended periods in the water, comfort should be a serious consideration. Besides excessive suction it is also worth taking note of the head strap. A single narrow may produce serious discomfort if it digs into the back of your head, and so to alleviate this pressure, many designs offer a twin head strap.